It’s part of a renewed effort by progressive groups and community activists to enshrine new restrictions on Nevada’s payday loan industry, two years after similar efforts to rein in the industry went down in flames. Although the concepts and battle lines are similar to those seen in the 2017 Legislature, a new wrinkle is present — whispers of a future ballot question and campaign to cap interest rates in the state if sufficient progress isn’t achieved through the 120-day legislative session. Democratic lawmakers have introduced a pair of bills that would have major effects on the payday lending industry, including a proposed database on high-interest, short-term loans as well as a proposed 36 percent interest rate cap on the loans. The Center for Responsible Lending estimates that the typical payday loan in Nevada has a 652 percent annual interest rate, one of the highest average rates of the 32 states that allow for high-interest loans. Although rates vary based on lender and the period of the loan, lawmakers including Democratic Assemblywoman Heidi Swank said the high rates were clear evidence of the need for a cap on how much interest can be charged. Usually grouped under the umbrella of “payday loans,” Nevada law allows for multiple types of high-interest, short-term loans — referring to any loan with a 40 percent or higher annual percentage interest rate. These range from everything from normal loans with 40 percent or higher interest rates, title loans (using the title of a car as loan collateral), deferred deposit loans (an agreement to transfer money or wages to a lender at a certain time in exchange for an up-front payment) and check-cashing services that typically serve people without bank accounts. The industry began to flourish in the 1980s and 1990s after lawmakers removed an 18 percent cap on interest rates (originally approved in 1913) as part of a 1984 special session attracting Citicorp to open a credit-card processing center in Las Vegas. Citicorp is gone, but the payday lending industry remains; Nevada has around 95 businesses licensed as high-interest lenders with about 300 branches. In 2016, those businesses made approximately 836,000 deferred deposit loans, nearly 516,000 title loans and up to 439,000 high-interest loans. And the industry has gained much clout in the Legislature: Payday lending companies contributed more than $172,000 to state lawmakers over the last two years, with top recipients including Assembly Speaker Jason Frierson and Senate Majority Leader Kelvin Atkinson (both received $23,500). At least eight high-interest lenders are represented by 22 different lobbyists in Carson City, including former top Democratic lawmakers John Oceguera, Marcus Conklin and William Horne. State law contains many restrictions on loans and consumer protections if a person defaults on a loan, but the state has never put an interest rate cap or a limit on how much money can be loaned beyond a limit of 25 percent of an individual’s income. Of the two bills affecting payday lending, Swank’s AB118 is straightforward — adding a 36 percent cap on interest rates for any lender currently licensed under the state’s legal structure for high-interest, short-term loans. She proposed a similar bill in the 2017 session that included a similar interest rate cap, limits on where lenders could be located and how many loans could be taken out annually, but the measure failed to gain much traction and didn’t make it out of the Assembly. On the other end, Democratic Sen. Yvanna Cancela’s bill SB201 takes a somewhat less intense approach. The measure would codify parts of the federal Military Lending Act — which prohibits loans above 36 percent interest and other restrictions on loans for active-duty military members — into state law, which Cancela said she brought over concerns that the federal Consumer Financial Protection Bureau is no longer actively supervising lenders for violations of the act and is instead only investigating complaints. The bill also allows lenders to include information on state-provided welfare services such as food stamps in their offices and — perhaps most controversially — create a tracking database for payday loans. The concept of a database isn’t new — at least 14 other states have created similar databases, paid for by nominal fees (between $0.49 and $1.24 per loan) and track information relating to loan amounts, any fees assessed on consumers, default rates and interest charged on loans. In 2017, Swank’s bill creating a database never made it out of committee, and an emergency measure creating a database introduced by Frierson passed the Assembly on a 30-11 vote but died in a Senate committee on the last day of the session. Members of the payday lending industry are already hinting that they’ll plan to oppose the database concept. 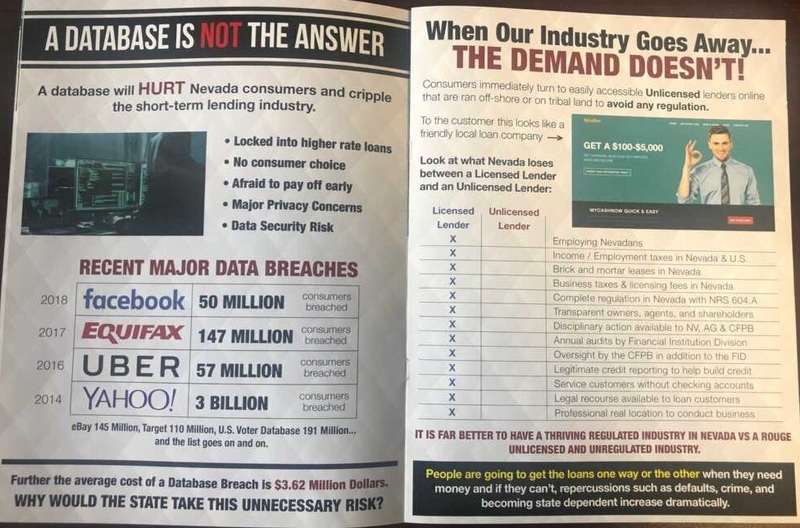 A glossy, multi-page informational book distributed to lawmakers by prominent lender Dollar Loan Center (which includes customer counts by Assembly and Senate districts) states a database “will HURT Nevada consumers and cripple the short-term lending industry,” citing recent major data breaches and warns that customers will be “locked into higher rate loans” if a database was created. Mike Weatherford with Nevadans for the Common Good, which held community forums in Las Vegas and Reno to raise awareness of the issue last year, says it supports both concepts but is planning to focus mostly on the payday loan database concept, seen as more likely to pass. Cancela said she wasn’t necessarily opposed to creating an interest rate cap, but said any limitations should be separate based on the type of high-interest loan. She also mentioned hearing about a potential ballot initiative, which she said could be helpful. “If there was a movement to put a question on the ballot, I would be more supportive than not,” she said. States including Montana and South Dakota have approved caps on payday loan interest rates through the ballot initiatives, and most recently in Colorado, where voters in 2018 overwhelmingly voted in favor of a measure placing a 36 percent cap on interest rates for payday loans with more than 77 percent of voters in favor. In total, 18 states have rate caps or outright prohibit high-interest, short-term loans. 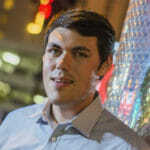 In a text message, Progressive Leadership Alliance of Nevada Executive Director Laura Martin said the organization was supportive of Swank’s bill to cap interest rates at 36 percent, but noted that ballot questions capping interest rates had been successful in several other states.